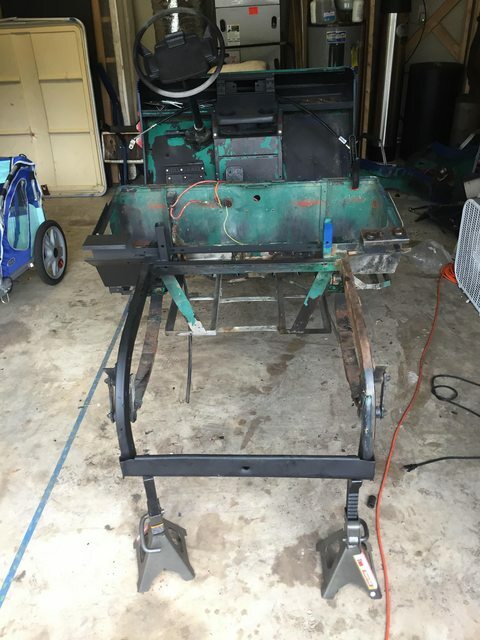 1987 EZGO Marathon (Electric) - "Penny"
Re: 1987 EZGO Marathon (Electric) - "Penny"
It's been a fun adventure. This welder is a spatter machine, but I've read some stuff about how to modify it so that it works much nicer. I'm looking into that. Looking good. We make a conversion to solid state speed control for this cart. I know! Unfortunately your Marathon kits were out of stock when I began sourcing parts for my conversion. 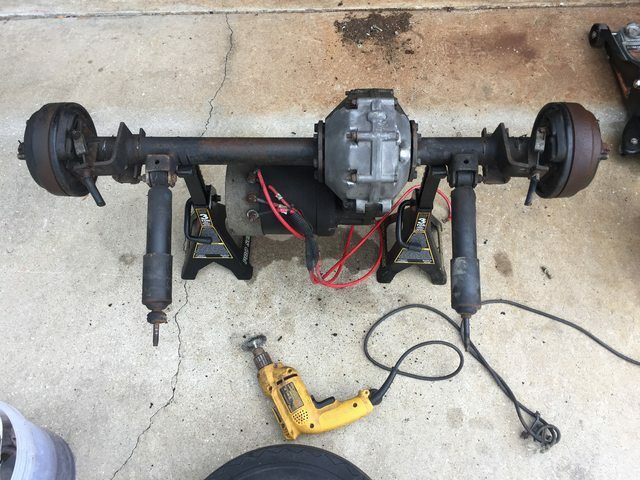 I got your email that you guys won't sell any of the linkage or mounting components separately so I'll have to figure out that stuff on my own. That's cool - I just didn't want to see you put all this work into the cart and over tax the old drive system New kits are available in 5 weeks. I plan to get the most possible out of the stock motor. 500 amp controller, hd solenoid, modified f&r, pb-6 and 2ga cables. Probably going to go 6x8v with a 12v squeezed into the middle for accessory power. I'd like to keep the bag well and don't need incredible range. 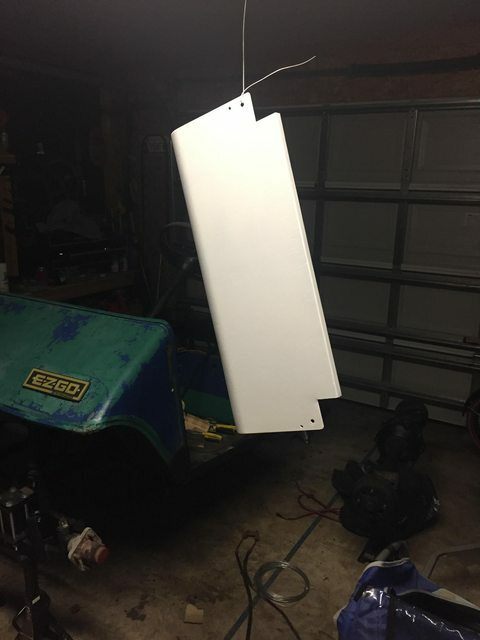 I'll post some pictures of the wiper board and resistor coils that came out of the cart soon. They are trashed. Nice start to a cool project! Some info on that rear end: Whose rear end is this? Pulled the passenger side rear fender so I can finish wheeling/painting the frame on that side. 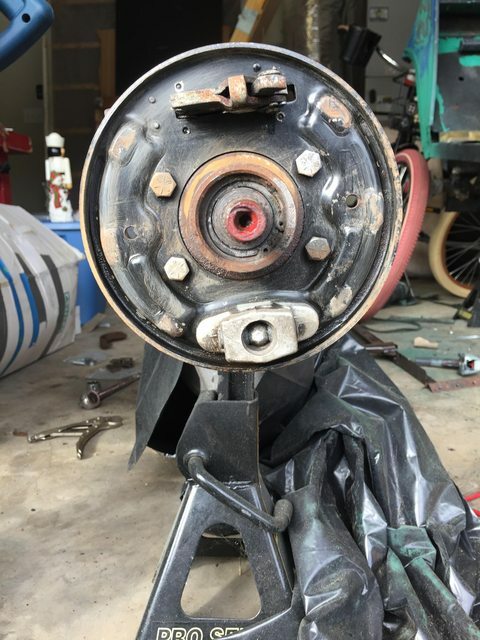 Removed rear axle. 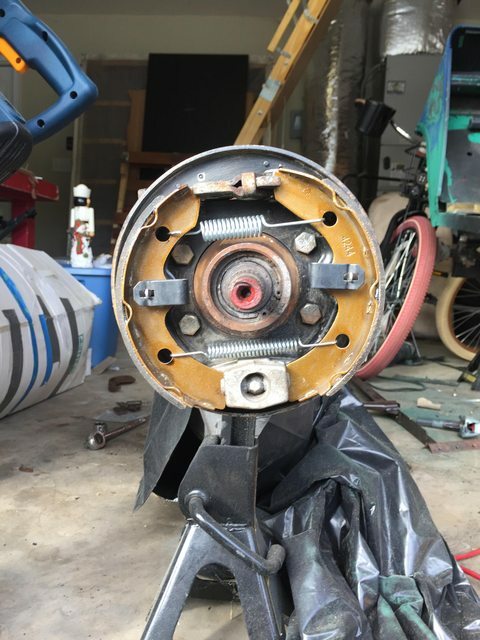 I was having difficulty getting the nuts off the tops of the rear shock bodies, so I used an old timing belt and vice grips to secure the shock body while I used PB and a breaker bar to get the nuts off. Then, I removed the rear axle and began wire wheeling/cleaning/painting things. 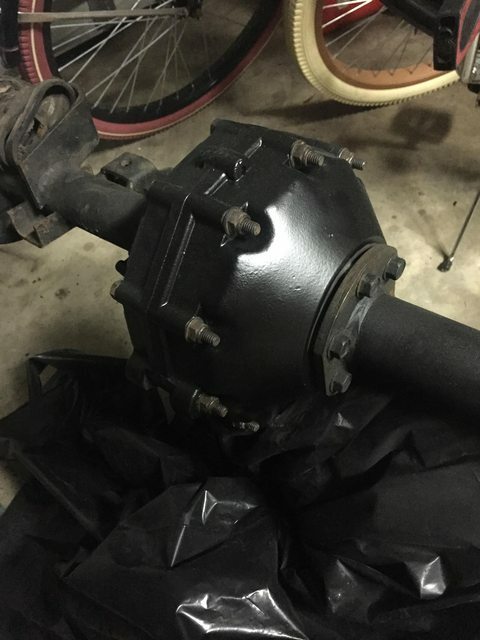 I began painting the differential with undercoating and addressing the surface rust in other areas. 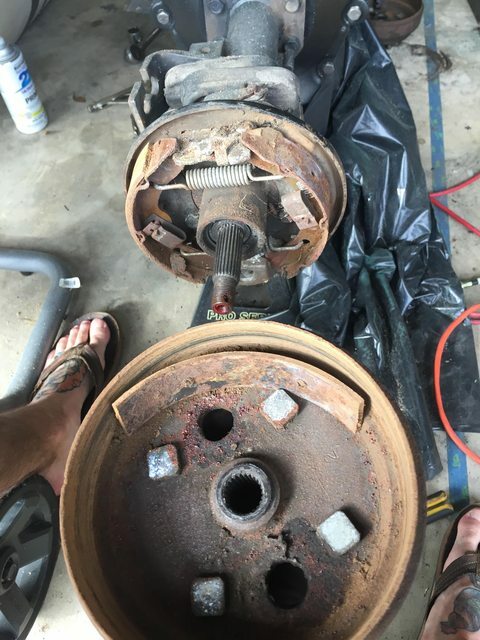 When I pulled the brake drum covers, I found one shoe on each side that had come loose from the bracket and was just hanging out inside the drum. I cleaned up the inside of the drums and installed the new shoes, springs and retaining clips (twice, since I did it wrong the first time). I installed brand new brake cables (no pictures yet). 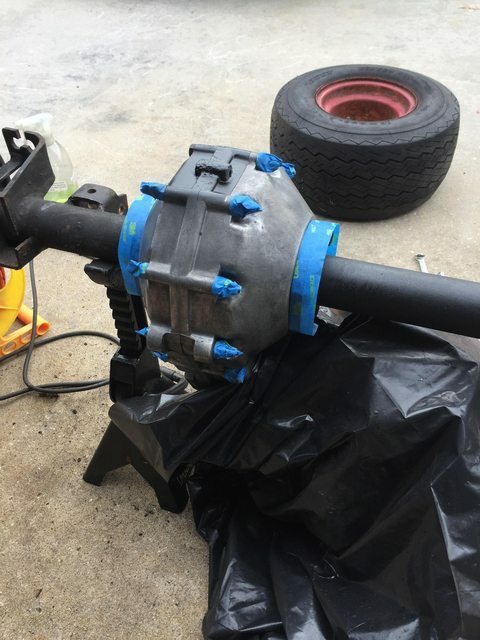 Finally, I began priming and sanding the motor access cover. Last fender off, more wheeling/painting to be done back here. Axle off. Woo! Beginning of cleanup/paint prep. 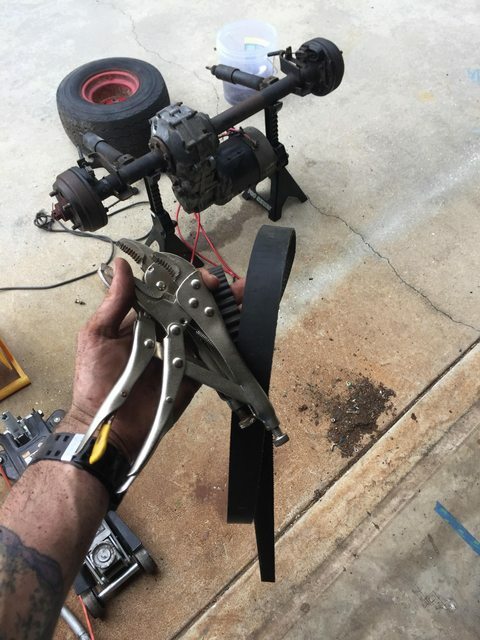 Is this how the brakes are supposed to look? New shoes! This was before I realized I had oriented them incorrectly. Second coat of primer before sanding. Thanks for the reply! So far, I have about $500 total in it but it needs a lot to look nice. I like your cart and wish I had nice, straight body panels like yours! I have zero experience with body work and there's a little too much to just throw some Bondo at. Looks good! Have fun with it and just so you know the Pennies will never stop, looks like your hooked.